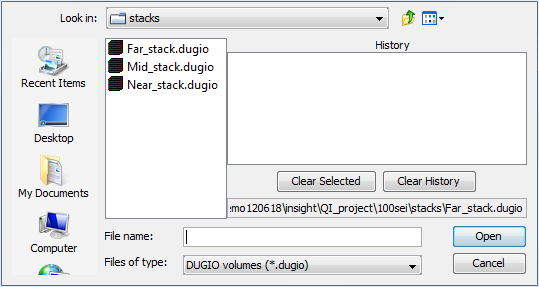 Once you have converted your volume data to the DUGIO format using the SEG-Y Loader, you can now load it to Insight. For details on the specific steps to import data using the SEG-Y Loader, see SEG-Y Loader Overview. 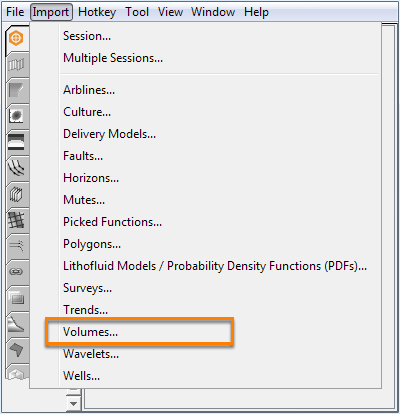 If you already have an existing volume in your project database, click on the Add icon in the Volume tab and select Load volumes already in the project to load it into your session. Note: When loading volumes, Insight will choose to use min/max from the class if it thinks there will be anything to see. Insight will estimate the range of the volume, and if that estimate is nothing like the class clip, it will choose to go with a per-volume clip. To adjust the min/max clip of the volume, see Volume Display Settings. In the Control Panel, select Import menu. Browse the folder and select the volume file(s) you want to import. Note: Insight does not support the import of depth volumes which have been applied with phase correction. These volumes will be imported but the phase correction will be ignored. For more details on phase correction, see Manual Mistie Corrections and Phase Rotation.